We started out quite early, with them picking me up at 8am this morning. 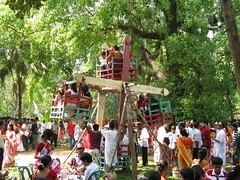 This is because many of the festivities take place in the morning, with many people up to see the sunrise. We went to one of the main locations for activities, which happens to be the university. We drove most of the way. But at one point traffic wasn’t moving anymore so we walked the rest of the way among the throngs of people doing the same. 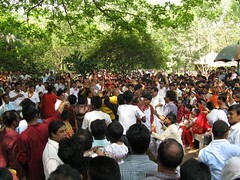 Everyone is in red and white, with many women wearing saris, which are considered more formal than the typical three-piece outfit (pants, tunic-style top and scarf). I wore a top that I bought yesterday which was red and white, with a red and white scarf, so I fit right in! 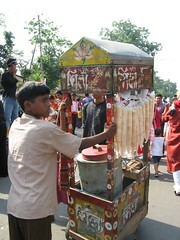 Everywhere there were vendors selling noise-makers, flags, all types of food, water, toys, etc. - the typical things you find at any festival. Plus live birds, just in case. 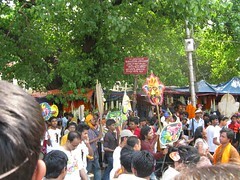 But unlike festivals in Bolivia, there were no vendors selling beer or any alcohol, because alcohol is banned in Bangladesh (although you can get it). Face painting was also very popular and about 100 people asked me if I wanted my face painted! Considering the amount of sweat I was producing I don’t think any paint would have stayed on my face very long. We went to a park on the university campus, where many people will go and have a breakfast picnic. To get in to any of the locations there were always long and surprisingly orderly single-file line ups of people (although somehow we managed to skip the lines), and there were several police officers at the gates. In fact, there were police officers everywhere. We walked through there for a while, stopping to see a few musical shows with the crowd dancing to the music. Did I mention there were a LOT of people? There were basically people everywhere…I doubt I’ve ever been to an event with sooo many people. It was also very hot. So the ice cream we had went down quite well. I was enjoying myself just watching all the people, with their friends and families, sitting, walking, dancing. After we finished at that location, we went to the place where the parade starts. Unfortunately we got there a bit too late and missed the parade. But I did see some very cool mini ferris wheels made of wood and driven by human power! I did not, however, have the courage to get on one, for fear it might fall apart. In this location there were more people milling about with friends and families, enjoying themselves, and also many food vendors. From there we went back out to the street and headed back to the car. On the way, we did catch a glimpse of the parade as it made its way back to the starting point. There were, again, lots of people walking and dancing in the parade, with musicians playing and people holding up big colourful masks on sticks. Overall I really enjoyed myself. One thing I have noticed here, compared to Bolivia, is that a lot of people like to stare at me. And they don’t try to hide it either. Only in one place in Bolivia did I feel like that, and it was in the middle of nowhere. I also saw people taking photos of me at the festival! My coworker joked that I might be in the newspaper tomorrow. So that was my adventure on Bengali New Year. Tomorrow it is back to the grind (in fact, I was back at the hotel by noon and have been working since then!). no photo in the paper! Submitted by Meg on Wed, 2008-04-16 11:45. As far as I know my photo did not end up in the paper, but then I didn't actually check! Submitted by Jenn (not verified) on Wed, 2008-04-16 08:41. It seems like you are getting the chance to experience some of the culture after all! That's great! I love being in other countries to celebrate big things! I'm heading to check out the pictures now! Submitted by Kim (not verified) on Tue, 2008-04-15 20:28. Looks like you're having great weather in Dhaka! It's great that you've been able to take part in cultural experiences like Bengali New Year. I find it quite funny that people are staring at you. Did your photo end up in the paper? I hope your work is going well. Keep up with the great posts!